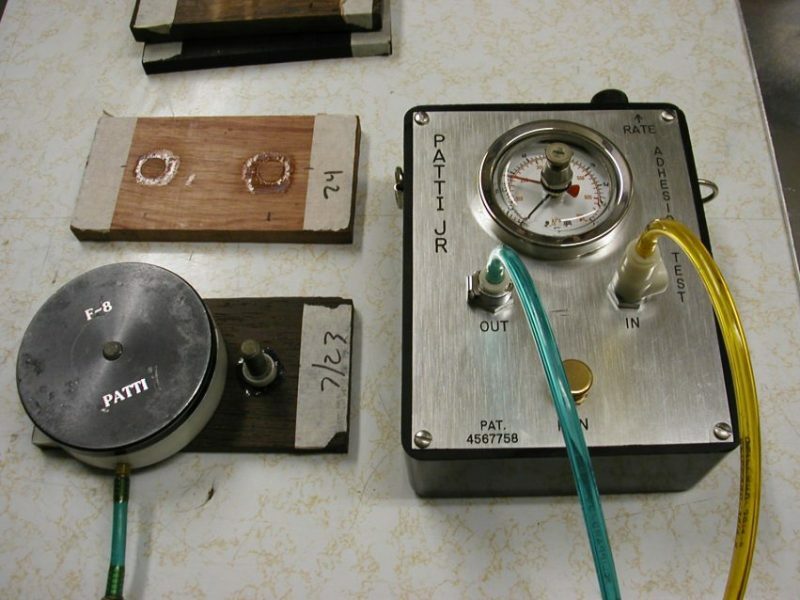 The PATTI test uses compressed air to pull the stud from the surface. It records the force required to break the bond in pounds per square inch. In all cases tested, the epoxy held and the wood failed. We thought it would be interesting to find out how well WEST SYSTEM® epoxy adheres to the different wood species. The 3″ × 6″ samples were just large enough to accept two PATTI (pneumatic tensile test instrument) studs. Two results per species does not provide enough data for scientific conclusions, but does give a good idea of what to expect. The samples were prepared for adhesion testing by sanding parallel to the grain with sharp 60-grit sandpaper. No solvents were used to remove any natural oils. All PATTI studs were glued in place using 105 Resin/206 Hardener. The PATTI test uses compressed air to pull the stud from the surface. It records the force required to break the bond in pounds per square inch. In all cases tested, the epoxy held and wood failed. The following results are all woods from Africa and the Philippines. Adhesion results for woods from other parts of the world will be shared in future issues of Epoxyworks. The predominant failure mode for each species was wood failure. A few of the 154 wood samples. These from Africa show a wide variety of colors, grain patterns and densities.